What you’re holding in your hands is a set of guidelines. A collection of protocols which describe an approach to another protocol, something we call Twitter. The amazing thing about this particular protocol is that it’s being defined daily. By you. Twitter was inspired by the concepts of immediacy, transparency, and approachability, and created by the guiding principles of simplicity, constraint, and craftsmanship. We started small. We built something out of love and a desire to see it flourish throughout the world. We defined a mere 1 percent of what Twitter is today. The remaining 99 percent has been, and will continue to be, created by the millions of people who make this medium their own, tweet by tweet. I leave you now in the capable hands of a documentarian, storyteller, and practitioner of a new protocol of communication. Listen, learn, and most importantly, define it for yourself. 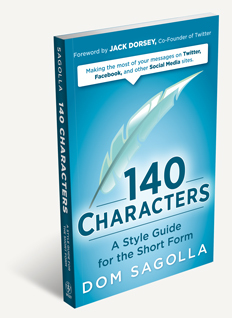 –Jack Dorsey Creator, Co-founder, and Chairman of Twitter, Inc.
Foreword to the book 140 Characters: A style guide for the short form (2009, Wiley). Available wherever books are sold, and on iTunes App Store.